1Terabyte of e-mail storage. This means you may be able to keep your e-mails on Yahoo forever if you wish. A terabyte (TB) of storage is equal to approximately 1,000 Gigabytes (GB) or a million megabytes (MB) — that’s a whole lot of storage space. Huge file attachments. 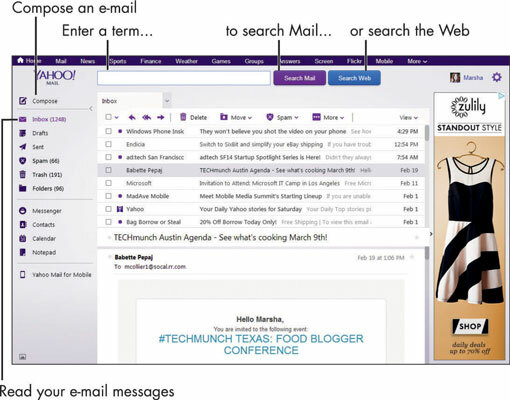 If you want to attach videos or other large files to your e-mails, it’s easy on Yahoo! Many servers limit the size of the files you can send through e-mail. Yahoo! limits attachment size to a 25MB (megabyte) maximum. Files of sizes up to 100 MB can be shared from your Flickr (Yahoo’s photo service, more about that later) or Dropbox accounts. Messenger. If you’re familiar with the old AIM (AOL Instant Messenger) feature, you’ll be right at home with the similar online-chat service that Yahoo! offers. In chat format, you can talk to contacts who have accounts in the Yahoo! service — either from the Yahoo! website or from a smartphone. Robust Help area. Notice the cog icon in the upper-right corner of the screen? Click it to see a drop down menu. Click Help to be transported to a simple-to-understand tutorial and help area. 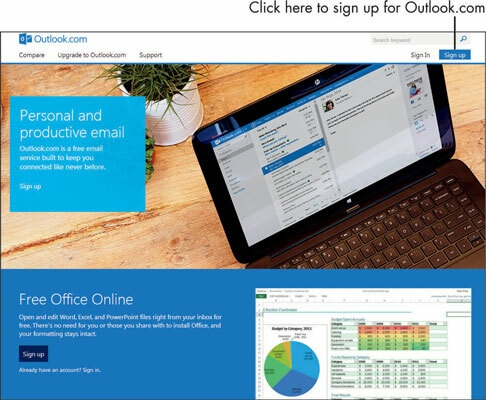 If you’ve used Outlook on your Windows computer as part of Office, you’ll find the online version very intuitive. Various Microsoft e-mail addresses such as @hotmail.com, @live.com, and @outlook.com live online under the Microsoft Live umbrella. First off, you need to know that the service is only run by Microsoft; those folks don’t fuss over what kind of computer you use. You can use either a Mac or a Windows PC and still avail yourself of these services. You may know of people who have msn.com e-mail domains, which are also served up by the Hotmail servers. 15GB of storage and growing. Google’s founders say no one will ever run out of storage space. Tabbed Inbox. No need to wade through e-mails to find the important (or personal) messages you want to see. 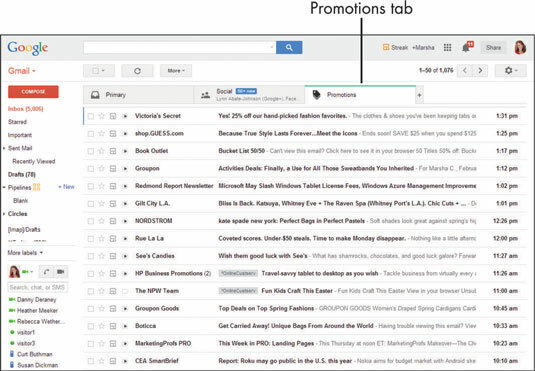 Gmail uses tabs to divvy up your mail into Primary, Social, and Promotions. So if you’re not in the mood to go shopping, you don’t have to see promotional e-mail until you feel like it. Gmail Hangouts, which is the Google version of Skype. You can initiate texts or video calls to other Gmail users from your page. Google Voice. You may connect any of your phone numbers to this service to act as an answering machine for your calls. You will receive transcriptions of voice mail through your Gmail account. SMS (Short Message Service), or text messages, which you can send to any other Gmail user through Google Hangouts on the Gmail desktop interface. All you need to find their name in the lower left corner and click to send an SMS or video call. A great spam filter.Spam is the name for advertising e-mail that is sent to you unsolicited by unscrupulous vendors to try to sell you goods or even to defraud you. Gmail smartly places spam in your Spam folder for you to review and delete at will. It’s scathingly good at its job. Google Calendar, an online calendar that is automatically yours when you have a Gmail account. You can opt to share your calendar with someone, or keep it private. And you see a Calendar window on your mail page. It syncs with your tablet and smartphone so you can view — and interactively update — your calendar without being in front of a computer. All that said, Gmail is currently the most popular and flexible free e-mail service.